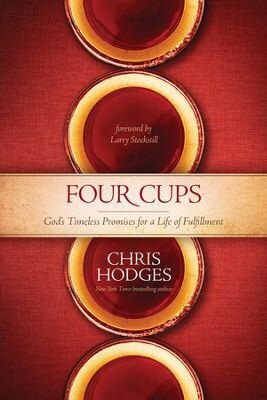 Four Cups: God’s Timeless Promises For A Life Of Fulfillment, written by Chris Hodges, is a book that strives to demonstrate to its readers that God has had a plan for their lives since the very beginning. Life always seems to be found somewhere on the plane of interesting. There are many curves, many decisions and many opinions to be heard, thus making it, at times, difficult to understand what path to choose. This publication by Chris Hodges strives to help Christians choose the right path, the path that God had ordained for their lives from the very beginning. The book begins by taking its readers on a journey back into the Old Testament, back to the point where the nation of Israel was enslaved in Egypt, back to the point where God makes four powerful promises to His people. These four promises are found in Exodus 6:6-7. God promised His people that He would free them from their oppression, rescue them from slavery, redeem them with a powerful arm and great acts of judgment, and claim them as His own people. These are the promises to the nation of Israel, but they are also present for all Christians, for all people who call upon the name of The Lord, for all who are willing to be cleansed by the shed blood of Jesus. Pastor Chris does a phenomenal job displaying the truth behind these promises for the nation of Israel, but he also carries their truth through time into our own lives today, helping us understand what they mean to us now, what they mean to our relationship with God. This publication is a must read, as if brings about a deeper thought process, a deeper understanding of what it means to be a follower of God. Remember how it felt to get picked? A group of people have gathered to participate in some type of activity. Before the battle can begin, teams need to be chosen. So one by one, a finger is pointed and a name is called until everyone is part of a team. Remember how it feels to hear your name called? When your name is called, it brings about a feeling of elation, a feeling of joy. You stand up, look around, take notice of your surroundings, and walk proudly towards your team and take your place. Maybe there were times we didn’t hear our names called until many more were released. Maybe we had to wait and hear something like, “You can have him.” Maybe there were times when we were not chosen at all. God has a team, and He has called your name. He wants you to know that He needs you to make His team complete. He wants you to understand that you are special. He wants you to know that you were chosen before you ever existed; that’s how important you are to Him. Lord, help me know without a doubt that You have chosen me to serve You, that You have entrusted me with the sharing of Your gospel. The simplicity of our purpose for existing is presented within these verses. Before Jesus went to be at the right hand of God, He presented to His disciples a breakdown of their purpose, a breakdown of our purpose on this earth. We are commissioned to take the message of Christ, the message of salvation into this world for the purpose of conversion, salvation, disciplining, and edification, but it doesn’t end there as some would have us believe. Many churches shy away from the necessity of baptism, but here we find it again flowing from the mouth of Jesus. Baptism is a necessary part of being or becoming a Christian, and to remove it is to remove a blessing, to declare it unnecessary is to miss out on a blessing from God. To proclaim it is not needed is to alter the desires and teaching of God. Lord, help me see Your word as exactly what I need to accomplish Your will for my life. How could they possibly be doubting the existence of Jesus after His resurrection while He was standing before their eyes? They saw Him, they worshipped Him, and yet some still doubted. Maybe the question that needs to be asked is as follows: If you doubted it was Him, why did you worship Him? Did they get caught up in the crowd? Were they trying to fit in with everyone else? Why pretend? Why fake it? Maybe we should be asking ourselves those last two questions. We have all doubted at one time or another, or maybe even numerous times. We have questioned where Jesus was when we needed Him. We have all wondered why He wasn’t there to help when we needed Him the most. It is or was during these times we have pretended to be Christian or faked our faith, because we just didn’t feel that it was real. There is nothing wrong with this unless it becomes the cornerstone of our beliefs, unless it becomes the habitual. Even when we question, we must reach for God and seek His face, for it is there that we will find that He is real and His love for us will never end. Lord, help me find You when it seems to me that I have lost You. It’s very difficult to understand why there is such a large controversy over baptism. How can someone not look at the life of Jesus and understand that baptism is a necessity? Before Jesus began His ministry He was baptized, even though He was sinless. Before Jesus went to be at the right hand of God, He proclaimed the necessity of baptism to His disciples. Look carefully at today’s scripture reference: Whoever believes AND is baptized will be saved. These are the words of Jesus. This is the declaration of Jesus. This is the teaching of Jesus. There are two conditions here: believing and getting baptized, two conditions that Jesus states are necessary for salvation. Who are we, then, to change the teaching of Jesus? Who are we to declare it is unnecessary? It is our job to follow scripture, not rewrite it to fit into our spectrum of beliefs. Lord, help me come to embrace all of the Bible, all of Your teachings, as the truth without exception. Talk about feeling about an inch high. Jesus rebuked the disciples for their lack of faith, for the refusal to believe those who had seen Him risen from the dead. He rebuked them, and we might wonder, did they really get what they deserved? They were only human, and in this form they were placed into a very difficult, emotional situation. They reacted. They reacted based on their earthly understanding. They reacted based on their conceptualization of a very difficult situation, and for this they were rebuked. Did they really deserve what they received? Jesus thought so, otherwise it would not have happened. The disciples had a very unique point of view within all the events that had transpired. They knew what was coming. They knew what events were happening, but they failed to see what Jesus had taught. They were trying to fit lives into the fact that Jesus was no longer alive, and then they were told differently. So they did exactly what we would have done. They refused to believe. Our refusal to believe doesn’t stop the truth from occurring. Our refusal to believe doesn’t stop God from working. Our refusal to believe prevents us from experiencing the power of God in action. Lord, help me believe in You so powerfully that I never doubt what You can do within my life and within this world. The soldiers knew what really happened. The chief priests knew from the soldiers what really happened. The truth in this case was not what they wanted released. The truth would have altered the power and influence of the chief priest, and this could not be allowed to happen. SO instead of embracing the existence of the Messiah, instead of embracing the truth of scripture as it was revealed through Christ, they chose instead to formulate a lie that would hopefully keep them in the elevated positions of self-righteous glory. So, in essence, they chose themselves over God, they chose themselves over the Messiah. Have you ever done the same? In all honesty, the answer to that question must be a resounding YES, for all have placed themselves before God at one point or another. In the weakness of flesh, we all have given in to personal desires over that of God. What we must do is come to this realization and seek the forgiveness of God before it’s to late. Lord, help me see clearly where I have fallen short, where I have placed myself before You, and come to the decision to prevent this from continuing. Sometimes it can be hard to trust in something our eyes can’t examine. Sometimes it can be hard to trust in something our hands cannot touch. While it is difficult to trust in something our eyes can’t examine, in something our hands cannot touch, it is easy to trust in something you can feel within your Spirit. We will not see the face of God until we cross over from this world into the eternal, but we can surely feel His presence within our lives if we so choose. Feeling the power of God within is a choice we make on a daily basis, a choice that will affect how we walk into each day. Lord, help me reach deep within to feel the presence of Your Spirit within my life, that I might know without a doubt that You are my God. Thomas received a bad reputation for his remarks. He was at a difficult place, a place filled with confusion, a place covered in hurt, a place surrounded by pain. Jesus was gone, and now they said He was alive, but this made no sense. In his understanding of life, Thomas could not grasp the reality of a possible resurrection. He could not see beyond the scope of his earthly understanding. This brought him to desire proof that Jesus was alive, thus applying to him the title of Doubting Thomas. Have you ever been in this position? Have you ever not believed in something without having concrete proof to validate the claim? We have all been there at one time or another. This does not make our faith weak. It actually finds us in line with the Bible. We are taught of the need to check everything against scripture. We are told to make sure it falls in line with the Word of God, for if it doesn’t, it is not of God. So, in essence, we could say that Thomas was only doing as we are expected, before it was expected of him, thus we could say, with a smile, that Thomas was an innovator not a doubter. Lord, help me have the courage to question the religious opinions of others if they do not fall in line with Your Word. He was gone, dead, missing, and now He was standing in front of them as plain as day. All of their hopes and dreams were wrapped up in His existence. All of their futures were tied to His teachings and promises. All of their lives were crushed when His life was taken from Him. They were trying to go through each moment and find some semblance of understanding from the events that transpired. Then, in the middle of their confusion, He comes back into their presence and says, “Peace be with you!” They were confused. They were hurt. They were excited. They were hurt, confused and excited all wrapped into one. Their emotional flood gates must have opened, for they were now, once again, standing in the presence of their Lord. While this had to be a strange moment, it also had to be one that healed their broken hearts, one that gave them a renewed hope for the future, one that, once again, changed their way of thinking. Isn’t that what following God is all about? We can all have a renewed hope through Christ. We can all have our lives changed because He has risen from the dead. Jesus has risen from the dead. The very presence of Christ within our lives should help us to come to a greater understanding of the power He can have within us if we would only let Him have control of our lives. Lord, help me transfer over to You control of my life. Help me trust in You and what You have planned for my future.